A review of disabled access at Scotland's football grounds has been called for by the Scottish Disabled Supporters Association (SDSA). The call follows a complaint that police and stewards stood in front of the disabled fans' area during Sunday's Ross County versus Rangers match. Ross County said it was looking into the matter. 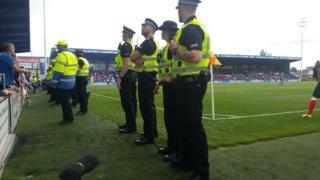 Police Scotland said it would take on board the concerns raised about disabled fans' views being blocked. SDSA chairman Sandy Riach said facilities for disabled fans was an issue for all clubs. The Aberdeen FC fan told BBC Radio's Good Morning Scotland programme that the pitch-level locations of wheelchair areas could be a problem. He said there was a situation at Aberdeen's Pittodrie stadium similar to the one at Ross County's ground in Dingwall about two weeks ago. Mr Riach said: "The stewarding and police, every time something happened, would run on to the park and obscure the view at the north stand completely." Where match photographers sit and also the position of advertising boards at some football grounds could also block disabled fans' views of matches, he said. Mr Riach said "in fairness" to Ross County, the Highlands club had provided new additional areas for wheelchair users. But Mr Riach added that Scottish football clubs needed to provide better facilities for disabled fans, including car parking and entry into the grounds as well as improved spectator areas. SNP MSP Fulton MacGregor, who is the convenor of Holyrood's cross party working group on the Future of Football, told Good Morning Scotland that it was "incumbent on football clubs" to make sure they catered for all fans. He added that disabled access was taken seriously by Scottish clubs. Mr MacGregor said: "Clubs are trying and I believe Ross County will try to make the right steps after this." In a statement to Good Morning Scotland, County's chairman Roy MacGregor said the complaint about Sunday's game would be raised with police in a routine briefing on the match. He also said the club would issue an apology if that was found to be necessary. During Sunday's match, police and stewards had to deal with concerns about the behaviour of some fans. The match commander, Ch Insp Ian Graham, said: "In briefings given to officers before matches we consider our response to supporting the stewards in relation to crowd dynamics and potential issues which could arise. "The disabled section is in front of a portion of the away stand, which officers were tasked to observe at points during the match for potential issues which is why they (the officers) would have stood where they were. "We will take on board the concerns raised about this blocking the view of disabled supporters and will include this issue in pre-match briefings in future to ensure we allow fans in this section a good view of the pitch."